The primary objective of this survey is to identify whether the availability, quality, and distribution of habitat acts as a constraint on the number of juvenile fish that can develop into adults. This study focusses on three types of fish with differing habitat preferences: Atlantic cod, whiting, and haddock in which year-class strength appears to be established around the period of habitat settlement. The study will use three sampling methods: demersal tows, fish traps, and a baited-camera census technique. Data from these surveys will inform the development of species distribution models (at a regional and stock scale) and will also be used to compare the selectivity of the three sampling methods. Otolith (fish ear bone) analyses will also be carried out post-survey to examine selection on settlement time and size-specific mortality. Genetic tissue will be stored and used post-survey to examine stock structure, primarily in cod. Collect measures of juvenile gadoid abundance using three different sampling methods. Record substrate features at the point of sampling. Collect sufficient otolith samples suitable for survival analysis studies. Collect sufficient genetic material to investigate issues relating to stock structure. 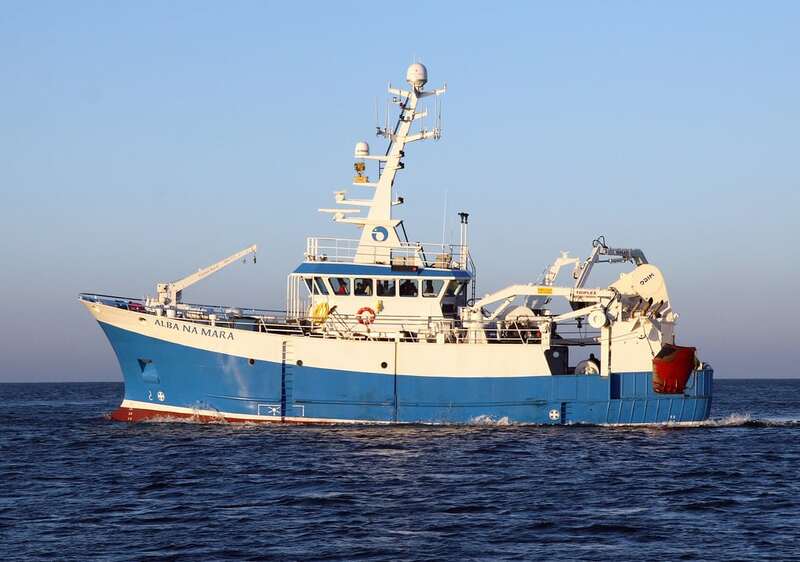 Scientists will join the vessel on the morning of 29 September and, weather permitting, the Alba na Mara will make its way to the Firth of Clyde. Fish traps will be loaded directly from an European Maritime and Fisheries Fund (EMFF) charter vessel. Stereo Baited Remote Underwater Video (SBRUV) Cameras. Underwater Television (UWTV) Benthic Survey. These will be performed at each station (with the exception that trawling will not occur at those sites within the South Arran Marine Protected Area (MPA) and only baited camera footage will be taken within the Lamlash Bay No-Take Zone (NTZ). 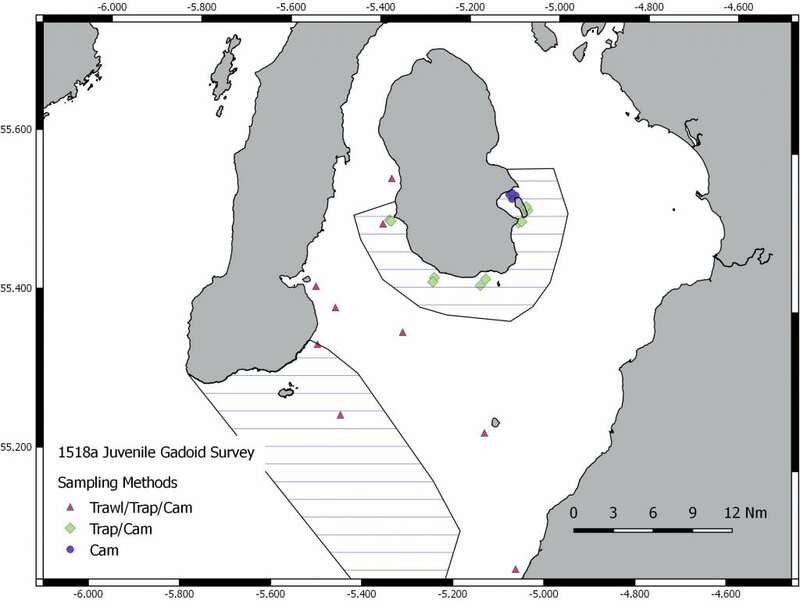 The demersal survey (30 minute tows) will assess the abundance, length-frequency-distribution, and weight-at-length of juvenile gadoids at nine fixed stations within the Firth of Clyde (i.e. those shown to be lying outside the South Arran MPA boundary, Figure 1 below). Samples collected at each. 1 cm size class will be retained and frozen for analysis at a later date. Occurrences of invertebrates and other fish species will be recorded and measured. Scanmar units will be fitted to the wings and headline of the Bottom Trawl type 158 (BT158) to ensure the net is fishing correctly. If possible, a low light UW camera will also be fitted to the wing/headline to enable footage of the substrate to be taken. A fish trap survey at all survey sites within the Firth of Clyde will be carried out during this survey, with the exception of the four sites within the Lamlash Bay NTZ which are sites 1-19. Traps (up to two fleets of four traps) will be deployed in the first half of the day and collected in the afternoon after a soak time of approximately six hours. Species composition and length frequency distributions of fish caught will be determined. Gill samples will also be taken from selected fish for genetic study at a later date. All samples will be weighed and, where appropriate (Cod, Whiting, Haddock), frozen. Occurrences of invertebrates and other fish species will be recorded and measured. SBRUV camera frames will be deployed during daylight hours (2-3 units will be available). These will be left in the water for approximately 1.5 hours before being retrieved. The deployment of baited cameras will happen at the same time as that of the fish traps and at distances sufficient to avoid any interaction with either the fleet ground gear or the other baited system (recommended minimum is 500 m). Footage will be downloaded to external media at the end of each working day. Species type, relative species densities (MaxN) and substrate type (assessed visually) will be classified post-survey. 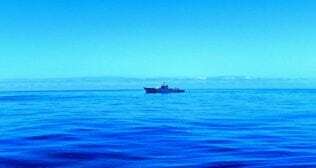 To further aid the classification of the substrate at each sampling site we will also undertake a series of short, five minute, UWTV video tows at two points along each demersal tow. To achieve this, the survey will utilise the EMFF UWTV system. This system is not operated from Alba’s UWTV umbilical, but is deployed from the hydro-winch on the vessel. As the system is lowered, the camera’s umbilical is attached to the winch wire to prevent fouling the propeller. The camera display unit will be set up in the bridge to allow the winch to be adjusted according to depth/height from the ground. Survey operations will take place between the hours of 07:00 and 19:00 (all times BST). Stations will be surveyed depending on the prevailing weather conditions i.e. if wind strengths or wave heights are adverse, a precautionary approach will be adopted and those with adequate shelter from the weather will be selected. Alternatively, in poorer weather the trawl survey may be prioritised over other activities. A half landing will take place on 7 October to comply with working hours and to allow planned changes to the scientific crew. EMFF camera frame, umbilicals (300m + 100m), camera system, lights and control unit. Flashback net camera, bracket and low light camera.